The fault of a deaf man and one of the best musical compositions ever written—one that gives me goosebumps every time I listen to it on my big honking Denon reference headphones: The Symphony No. 9 in D minor, Op. 125, the final great work of a Herr Ludwig van Beethoven, of Bonn, Germany. Picture this: The 1970s, the greatest rock era of them all. Plus, disco. The exact year: 1979. The year the Rolling Stones recorded Emotional Rescue, Debby Harry rocked everyone with Heart of Glass, and Chic made the world dance with Good Times. It was also the year in which Philips and Sony were working on the first audio CD standard. Philips wanted a 11.5-centimeter disc, while Sony wanted a 10-centimeter format. Both were enough to fit any of those vinyls, the smaller size capable of storing 60 minutes of 16-bit 44,056 Hz stereo music. But that wasn't enough. Norio Ohga said so. Ohga was a man mad about audio. He trained as an opera singer and, after listening to Sony's tape recorder for the first time, he sent a letter criticizing its audio quality. He was offered a job at the company, and his influence was so big that he became president of Sony in the 80s. But, back then, he was just overseeing the project and he demanded that the CD format should be able to play back the whole Ninth Symphony. According to Philips, the "longest known performance lasted 74 minutes [...] a mono recording made during the Bayreuther Festspiele in 1951 and conducted by Wilhelm Furtwängler." 60 minutes wouldn't cut it, and so it became 74 minutes—12 centimeters. At least, that's what some people say. Others say that it was famed Austrian orchestra and opera conductor Von Karajan who wanted the format to hold the entire Ninth. Von Karajan was instrumental in making the format big among the audio connoisseurs, and put that as a condition for supporting it. However, Philips' chief engineer Kees Immink has a completely different story. He says that 12 centimeters was the final length because it was a neutral size. Neither Sony's nor Philips'. But that, my friends, I don't want to believe, even while it's the truth. I prefer to believe that it were the crazy German and the mad Japanese that made it 74 minutes. It's just so much more romantic. It is a good PR story. In fact, it was all about the slight advantage Philips had with their factory able to make 11.5 cm discs. 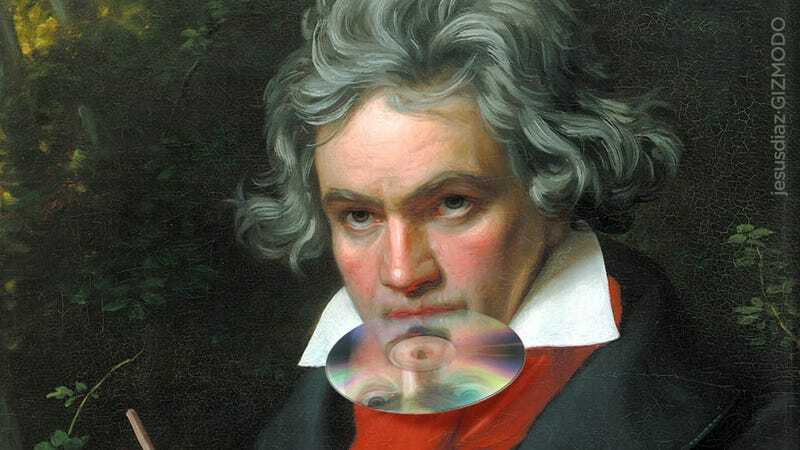 An article by my hand—Beethoven, Shannon, and the Compact Disc—offers a detailed discussion on the 12 vs 11.5 cm diameter issue.